Pitampura is a posh residential area in North West Delhi known for being a commercial, retail and residential hub. It’s a planned locality developed by Delhi Development Authority in the 1980s. It’s also home to thousands of government employees working in central administrative services. Pitampura is notable for its large number of housing and apartment projects. Because of it’s close proximity to essential amenities it’s a much sought after residential zone in the city. Pitampura is famous for ‘Dilli Haat’ which is a microcosm of culture, art and food. It’s an open air bazaar where one can indulge in food and arts and shopping. Pitampura is also home to some high street brands and jewellery shops which make it a shopper’s paradise. The nearest railway station is New Adarsh nagar and is 3 km from Pitampura. Pitampura is the kind of neighbourhood where it’s hard to not find what you are looking for. From eminent educational institutions, hospitals to shopping malls, it has them all. Amenities are a critical factor in deciding while relocating to a new place. Pitampura is a locality which is not going to disappoint you whatsoever. Pitam Pura is, undoubtedly, an amazing neighbourhood. However, the process of relocating is such an arduous task. Not to mention the mental stress that comes with it. Sometimes relocating cannot be done single handedly and we sure could use some help. Availing the services of an experienced and dependable packers and movers could really save you time and even money. Pikkol is a Bangalore based logistics company that is here to allay your relocation woes. 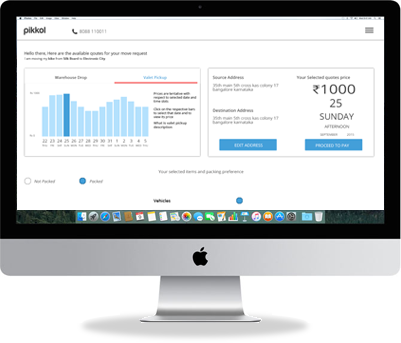 Pikkol aims to identify the dilemmas customers face regarding accountability, reliability and transparency and then leverage technology to solve them. At Pikkol, we offer custom-made relocation packages. With the help of our adaptive algorithm, we take stock of the inventory, calculate packing requirements, right truck size and most importantly, the cost. We are also very user friendly. With the help of our app you can get place a request, get tracking updates and even schedule your drop. With a robust technological framework backing our back-end process and an army of skilled professionals, we intend to provide a hassle free and reliable service to our customers. Pikkol Packers and Movers with their experienced team make shifting and relocation process comfortable, free of distress and within your budget. Backed by unique technology, one regularly gets updates and messages with respect to packing, delivering, and quotation of pick up services etc. They even have GPS facility available with regards to shipment. Pikkol Packers and Movers strive to make movement a pleasurable experience at every step Happy Moving! !